The Standby UPS offers only the most basic features, providing surge protection and battery backup to the connected equipment. 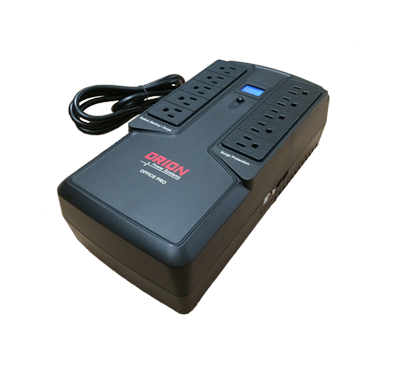 When there is a power outage, brownout, or over-voltage, the ups switches over to battery power and runs on the inverter to provide AC power. The inverter on the stand-by models typically outputs a stepped square wave. This type also has a transfer time to battery power of typically 8-10 milliseconds. These models are designed for less critical applications like PC ,routers, and small security DVRs. The Orion Power Systems Office Pro LCD flat model is available from 550VA to 750VA and is the most cost effective solution for managing and protecting power for your critical computing, network, and peripheral equipment .